A LTTE terrorist was killed ambushed this morning (February 28) by Police Special Task Force (STF) personnel in general area Vellaveli, Batticaloa. According to military reports, troops on receiving early information of an LTTE movement in the area have laid an ambush in a semi-jungle patch and gunned down a terrorist at around 5 a.m. The troops have managed to recover an LTTE body which was later brought to the general hospital at Batticaloa for post- mortem and magisterial inquiry. During subsequent search operations conducted troops also found a T-56 assault rifle, 01x claymore mine, a detonator, a hand grenade, 3x T-56 magazines, a wire roll and few 9V batteries. Nine terrorists including an area LTTE leader were reported killed said MCNS, during clashes erupted between LTTE and troops at Wanni defences on Wednesday (27). According to reports, 3 terrorists were killed in confrontation with troops in general area Kovilmoddai, Vavuniya yesterday at around 2.15 p.m. A body of a female terrorist and T- 56 assault rifle was recovered by troops in subsequent search operations, MCNS reported. 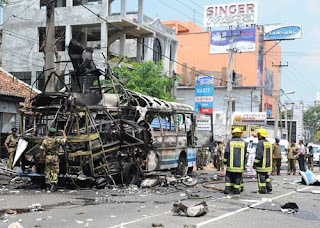 Six other terrorists were also reported killed in clashes at Thiruketheeswaran area in Mannar, yesterday at 4 p.m. 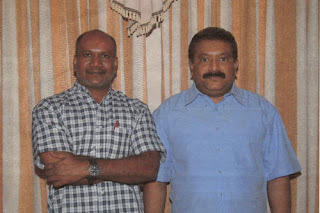 According to MCNS reports, it was believed that an area LTTE leader named 'Victor' was among the dead or had sustained injuries in confrontations. Meanwhile, troops conducting search operations in general area Ponarasankulama, Vavuniya recovered a T-56 assault rifle, magazines and 60 ammunition rounds at 6 p.m. The search operation was conducted on civilian information, where the items were found hidden in an abandoned house. Defence Spokesperson Minister Keheliya Rambukwella addressing media yesterday (27) during a press briefing held at MCNS stated that all preparations were made for the local government elections in the Eastern province on March 10, contrary to the picture of violence and distorted cheap propaganda by certain groups and parties. "Only 26 election related incidents had been reported so far in Batticaloa and they too are minor incidents. Police are fully investigating those incidents," the Minister said. "There had been elections which had become a 'black mark' in this country. "So compared to other elections the local polls campaign in Batticaloa is one of the best elections so far," the Minister added. Minister Rambukwella also drew attention to the incident concerning the former Executive Director of ICES (International Centre for Ethnic Studies), Dr Rama Mani, explaining that the UNDP Chief of Policies and Programs, Omar Norman, had signed a petition requesting that her visa be extended and had later complained that he was tricked into signing it. The Eastern province is now going through a massive development process under the "Nagenahira Udanaya" he further stated. The GoSL has embarked on ensuring economic freedom to the Eastern population by implementing development projects costing Rs. 6.1 billion, the Minister remarked. It is a great achievement to be able to hold local elections in the east, which also underlines the government's urgency to refurbish democracy in east while implementing its road map for the mega development projects, the Spokesperson said. However, Minister Rambukwella also pointed out that even in superior democracies it is not always possible to prevent incidents of this nature adding that such incidents can be expected in an area liberated from the clutches of terrorism in the recent past. Click this image for Get large View. Mannar police recovered a large stock of explosives including several powerful claymore mines, grenades and a suicide kit from an LTTE safe house in Periyagama area on a tip off in the evening. According to the available information the search operation was launched at 10.30 a.m and 125 anti-personnel mines and a claymore mine weighing 5 Kg were also among the recoveries. 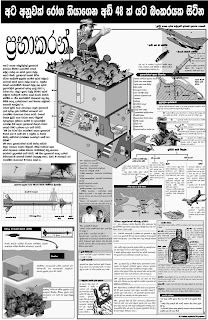 Aid workers and reliable sources reveal a worsening crisis in districts of Kilinochchi and Mullaitivu, with LTTE terrorists forcing men, women and children in these non-liberated areas to provide blood to the outfit, defence sources said. With few volunteers responding to its calls for blood, the LTTE is now targeting school children and even adults past their prime to obtain supplies of blood for its fighting cadres. The LTTE's "Thileepan" unit is reportedly involved in this heinous activity. It is even threatening those who do not volunteer for blood donations with severe reprisals. According to available reports, 40 students in Kilinochchi were dragged to the Anandapuram Technical College on 22nd January, where the LTTE has stationed its blood banks, to draw blood from them. On 28th January, school children and civilians were dragged away and forced to give blood to the mobile units of LTTE in general area Vaddakachchi, Kilinochchi. People were taken to these LTTE blood banks in tractors of LTTE. Not even elders or children were spared, eye witnesses who were able to flee the areas revealed. Pakistan President Pervez Musharraf has expressed his support for the efforts of the Sri Lankan government in its fight against terrorism. He emphasized the need to eliminate terrorism in all its forms and manifestations, the foreign Ministry said in a statement at the end of a meeting between Foreign Minister Rohith Bogollagama and the Pakistan President in Islamabad today.